So today on some spur of the moment thought I decided to make some laser dye with highlighter juice and isopropyl alcohol. I used my band saw to cut some acrylic for containing the dye, however, the hot glue-sealing operation got so messy I probably didn't need to make such a fuss over it. 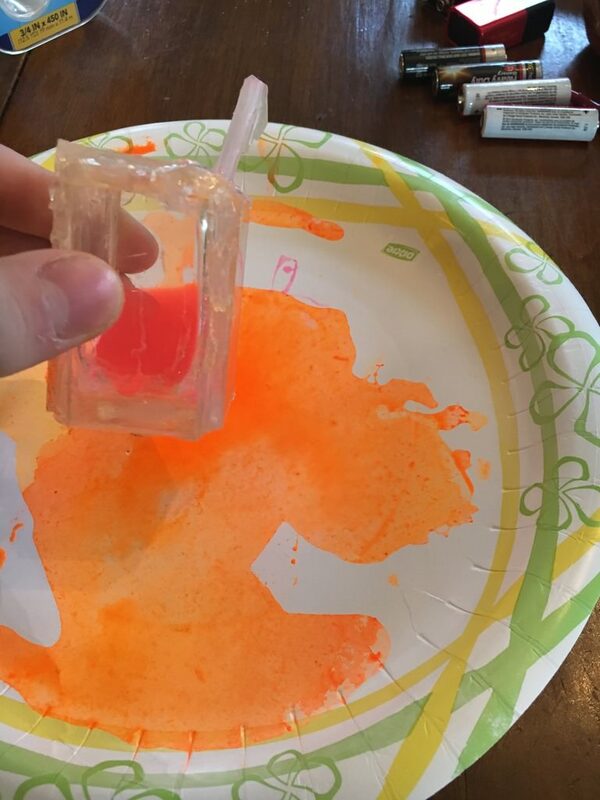 Here is the dye cell with dye in it. I started by pumping it with a 532nm green from a projector I made a while ago, but for a few reasons, I didn't get as much light production as I wanted. This gave me an idea, What if it becomes a diode-pumped, dye night light? 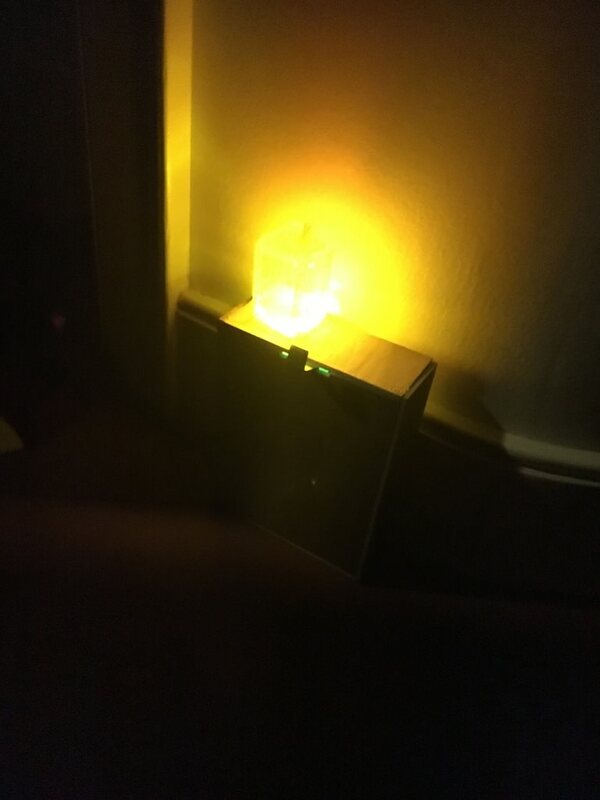 So here is the final product, it is battery powered so I wouldn't really use it as a night light, but my cat seemed to like it while it ran. You need to copy the direct link to the image, not to the Google Drive page. On Firefox you can right click the image and select "copy image location". Update] Do NOT switch to Photobucket! Noooo! Not Photobucket, in time they will shut down third party hosting on you, if not already paying their ransom. we rarely hand out bad info--fotofukit has been screwing with us-- many lost pics that may not be able to get back..
Those would look quite cool with a dye sitting glowing in them actually. I was going to suggest something more like this. Still, that thrown together acrylic container does the job in a pinch to test out the idea. Also, for the love of god stop using Photobucket. Try out Imgur, it's much better. I considered using the glass bulb from an incandescent light bulb, similar to what you suggest. This project was just a fun thing to keep me entertained on a monday afternoon. Yes, getting things to fluoresce can be a lot of fun. If you are just trying to get fluorescence, try a 405nm laser. They can be cheap to buy and will get any fluorescent material to light up brightly. Sounds like good fun, and a 405 nm diode would be ideal has a pump. If you mount it close to the dye container it'll probably be fine without a lens or anything. You could also UV led's to do the same, which are more efficient at low power but less efficient at high power. I like the idea of using different dies though, you can make a light any colour you could this way, possibly better than you could using RGB led's as you can make actual yellow. It's probably not gonna be the ultimate lamp, but could make for very nice decorative lamps. frowned upon by the Forum Community. Oh haha I do apologize for that, at the time I hadn't realized you need a quote to actually respond to someone. That was meant to be a response to Cyparagons excellent suggestion. Ill make sure to keep using quotes now thanks. if you come to a thread and see, say-- 4 posts you want to reply to... either use the 'multi-quote' then 'quote for the last one.. or copypasta- then your new post will have all the quotes & you can reply under each one or all in one post. There are exceptions to the no doubles 'rule' --most often its a B, S, or T thread and the OP is posting (again) to bump his thread towards the top-- and draw more readers-- no limit to those posts..
One other time would be a thread that is old but still relevent and the last post belongs to someone w/ new info to add-- that way those who have subbed the thread will get a nota about a new post--likewise tho.. In some cases you need to read more of the last posts--just in case another member necro-posted and any additional (necro)posts only complicate the problem. PM me or any Vet for more questions & answers.